This drive-on stand makes operating from your car really easy. Just drive the wheel of your car onto the base-plate and insert your mast into the steel sleeve. You're on the air in minutes! Perfect for operating from near the beach or from local high-points. Add one of our popular Travel Masts for a great portable set-up that you can keep in your car ready for any operating opportunity. A handy accessory for the well-equipped emergency communicator too! Our drive-on stand for masts is suitable for use with SOTAPOLES (7 and 10m) and the Compact Travel Mast. It is not suitable for our Mini Telescopic Pole or The Tactical 7000hds. Made of mild steel with an attractive silver painted finish it will give many years of service. Great with aluminium poles up to 58mm diameter. Quick and easy to assemble and take apart for transport, the stand separates into two parts. Recommended maximum pole height 10 m (telescopic fibreglass mast). Guying recommended in windy conditions or when using antennas that exert a significant "pull". For some slimmer masts you will need to pad out the sleeve to get a good fit. I finally got around to using my drive-on mast support. It's quick and easy to assemble, although I was slightly concerned with the fine threading on the tube and thought it might be easy to cross-thread if you're a bit clumsy; however I just take my time and it goes together just fine. Under the wheel of my Toyota Land Cruiser the mast was perfectly solid with my 8m mast with a 40m inverted 'V' mounted on it. My mast was slightly 'sloppy' in the socket, but that was a simple fix, just pop an old t-shirt or towel over the top of the tube before you push your smaller mast down in to it and that holds it firmly with the added protection of some padding around your fibreglass mast. 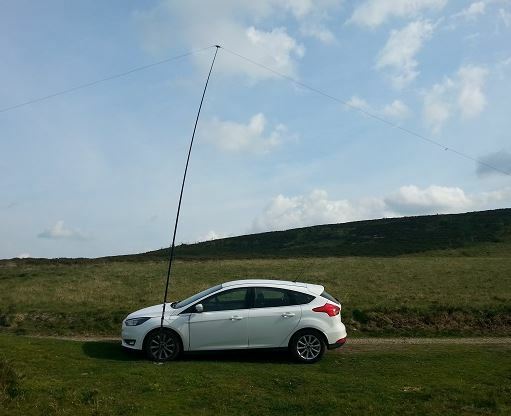 I've also tried it holding up a 10-Element 70cm Yagi on my 8m mast and there was no movement from the base of the stand, so it's perfectly usable in light wind conditions. Now thinking of buying a second one! Problem I found was that the base flexes when i use a 12m spider pole. it's not rigid enough. it needs to have some angle iron type fixings to make the thing riigid. I would not be confident putting my mast up in anything other than a light breeze. Seemed comfortable with my fibreglass Spiderpole 12m in a 'Moderate Breeze' (Beaufort 4, 15mph) with no guying. Very solid builded, looks good, works good, too heavy for SOTA but perfect for car based activities. Hild a 10m beam without further support. Judging from the photos and dimensions, this doesn't seem like it would be enough to hold a 2.26 Kilogram fiberglass pole. Boy was I wrong. Once this is anchored by the car's tire, it is solid. Since the base of my pole was a little smaller than the vertical tube, I wrapped a cloth around the pole and slid it in. It made a nice sturdy fit with no stress on the fiberglass section. This is great for a quick set up in a local park or for testing new antennas in my driveway. I have been searching for this for a while now, even designed my own, then found the identical thing I drew up offered by Sotabeam at a very reasonable price. Easy to use, it makes setting up my inverted V a snap wherever I go! I love it. The Sotabeam Customer Service simply cannot be beat.